Greg Mortenson: "Three Cups of Tea"
Preface: I picked up a postcard at the entrance of Stanford's Green Library "Three Cups of Tea". It's a book about "One Man's Mission to Fight Terrorism and Build Nations... One School at a Time". The front of the postcard shows three young Muslim girls reading. In back of the postcard is a quote from NBC's Tom Brokaw: "Three Cups of Tea is one of the most remarkable adventure stories of our time. 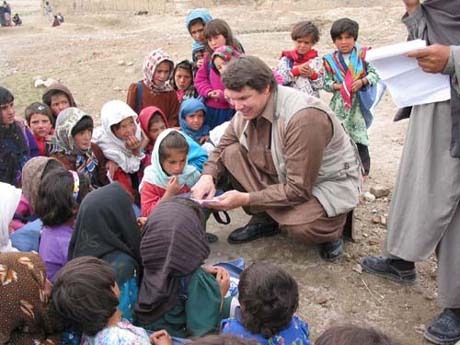 Greg Mortenson's dangerous and difficult quest to build schools in the wildest parts of Pakistan and Afghanistan is not only a thrilling read, it's proof that one ordinary person, with the right combination of character and determination, really can change the world." The author Greg Mortenson was going to speak at History Corner, Building 200, Room 002 on Tuesday, March 21 at 7:30 pm. This is the same place where Professor Robert Thurman of Columbia gave a scintillating talk on "Buddhism: More Than Religion" (March 3) and Professor Stanley Insler of Yale presented an inspiring talk on "Zarathustra: The Man and the Message" (March 13). I'm not familiar with Greg Mortenson but after checking his web site, it struck me that here's someone who is putting the philosophy of Buddha and Zoroaster into action through good work and good deeds. A friend who was going to give me a ride from Foothill College to Stanford was late and we got to the lecture at 7:45 pm. The room was packed and luckily I found a seat in the second row. Because of glitches in Greg's laptop, his lecture was delayed. Someone in the audience went up and helped to get his PowerPoint presentation in working order. What happened next was one breathtaking slide after another Mountain-top views of K-2, scenic shots of mountain ranges, Pakistani and Afghan villages, poor living quarters, sage-like portraits of tribal elders, and oh the children poor and malnourished, but all eager to learn and get educated. And this American mountaineer coming to help them build a school, then two, and finally 55 over a 12-year period. This is truly an inspirng tale of heroism and pure-hearted devotion to the highest ideal of mankind. After his lecture, I went up to Greg and shook his hand, telling him how much I enjoyed his slide show talk. Then I gave him a big hug, saying: "I'm proud of what you're doing it's truly Bodhisattva action!" Greg appreciated my remards, we exchanged business cards, and he signed the "Three Cups of Tea" postcard: "Peter May your spirits soar! G M" (perhaps his Balti name or initials?). Greg's talk ended at 8:35 pm and the Q & A session ended at 9 pm. Here are my 7-pages of notes with web links on this wonderful human being to share with my readers. Mary Dakin the Associate Director & Outreach Coordinator from CREEES (Center for Russian, East European and Eurasian Studies) introduced Greg Mortensen "Greg is the founder of Central Asia Institute in Montana. Greg will speak about his experiences that led to his recent book Three Cups of Tea which is ranked #14 in its first appearance on the New York Times Best Seller List" (March 26, 2006). 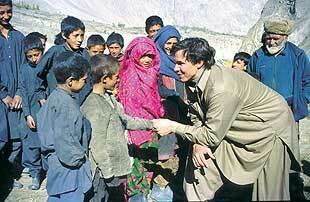 Greg Mortenson: I grew up in Tanzania as a boy near Mt. Kilimanjaro. There's an oral story-telling tradition in Africa, so I'll be following that tradition tonight in my slide presentation. My father founded the Kilimanjaro Christian Medical Center. My mother also founded an organization (?) there. In the mid-1970's I came back to America and got beat up in Minneapolis-St. Paul. It was my first experience of violence which I never had in Africa. I joined the U.S. military. My sister Christa had severe epilepsy. After watching the film Field of Dreams, she wanted to go to see the Field of Dreams in Dyersville, Iowa. On July 30, 1992, my mother was going to take her there. And she had packed her bags the previous night. My mother went down to get her at 6 am, and found Christa died in her sleep [she was 23-years old]. I was heartbroken and went to Pakistan the following year to climb K-2, the world's second-highest mountain. I wanted to honor my sister's memory, and took along an amber necklace that she wore. I wanted to put her necklace on top of K-2. K-2's 28,251-foot peak is 4-miles high. Although Everest has a higher altitude (29,017 feet), the summit of K-2 is more difficult to climb. [As of June 2000, only 189 people have climbed to the apex of K-2 compared to almost 1900 who have ascended to the top of Everest.] The granite mass of K-2 can fit 82 Matterhorns inside! The masculine peak of K-2 is called Chogori by the locals. There is also a feminine peak (name ?) that is a gentler climb. In 1993, we started out with 12 climbers. We took the Western route because there is less chance of an avalanche. We passed a pyramid of metal plaques honoring those who died on K-2. This memorial was named after Art Gilkey who died on K-2 in 1953. After 78 days, I got very close [25,000 feet] but didn't quite get to the top. I was so busy climbing that I failed to notice the beauty all around me the great ice cathedrals, the towering spires, the fluted ridges, the panoramic scenery. This sherpa [slide] carried my load down the mountain. I was totally dehydrated and emaciated. The Korphe villagers nourished me back to health with goat milk and paiyu chai (green tea) marinated with yak butter. So the first chapter of my book is titled "Failure". In the village of Korphe, Pakistan, the child mortality rate is one out of three die before the age of one. In 1999, the hemoglobin count of the women there is 8-9, much too low they were all anemic [Normal hemoglobin count is 12 g/dl-16 g/dl for women and 14 g/dl-18 g/dl for men]. The literacy rate there was 3%. Children squatted on their knees scratching their lessons in the dirt with sticks. There was no teacher he was in another village. Korphe was so poor that it could only afford the teacher's $1 daily wage for two days per week. But the kids looked so determined and enthusiastic to learn. They reminded me of my sister Christa. Since I couldn't help her anymore, I decided that I'd help them. So I promised that I will build a school for them. I learned a very important lesson in 1996. I had been working for three years to get the first school built in Korphe. I was doing what we call in the West "micromanaging." One day a wise, old village chief named Haji Ali [slide he looks like a sage!] took me aside and said, "We are grateful that you are going to build the first school in the area and bring education to our people. But you need to do one thing: You need to shut up, sit down and let us do the work. You need to let go and give empowerment to the local villagers." Late that evening, we were drinking paiyu chai salt green tea with rancid yak butter. Haji Ali told me, "In our culture it takes three cups of tea to do business. On the first cup you are a stranger. The second cup you become a friend, and the third cup you become family. The process takes years." Later, on my own, I compared it with 30 minute power lunches in America. Over there, I have learned, it's about relationships. The first school we completed in 1996 had 5 rooms and could accommodate 100 Korphe school children with an endowment for a teacher's salary. Then I built more schools in northern Pakistan and also in neighboring Afghanistan. By the winter of 1999, we had built 22 schools, and more villages all over Baltistan wanted to be next. In the late 1990s, I received many threats from hard-line local religious leaders near the town of Jafarabad, one of the proposed sites for a girl's school. A handful of mullahs claimed that I was an infidel teaching Muslim girls to read and write, violated the Koran. One leader, Mullah Agha Mubharik of Chutran, issued a fatwa, a religious decree that sought to ban me permanently from Pakistan. One day I was called into the middle of a mosque in a kind of inner sanctum. Eight mullahs were there, very imposing with black turbans on. And they brought me this red, velvet box. I thought this was it. I'm going to get kicked out of the country. Instead, Said Abas opened the box and inside was a letter in the ornate Persian Farsi script which basically said that they have reviewed my request. In the holy Koran, there's nothing that prohibits education. In fact, it encourages education for both our "brothers and sisters". Furthermore, as an infidel I had not only their approval but their blessings the work that I was doing was in the highest principles of Islam. It was a sigh of relief that my work in building schools for girls in Pakistan had approval finally. When girls are educated, there is population control and less infant mortality. Young men needs permission from their mothers to go on Jihad. If mothers are educated, they won't condone their sons to become suicide bombers or perform acts of violence. The mullahs on the other hand fear education. That's why the Talibans bombed all the girl's schools. Most men leave their villages, but the women stay behind their communities. When I saw my old friend Haj Ali, he was sad because his wife of five decades had just died. She was buried facing west to Mecca. Haj Ali told me that he may not be seeing me the next time when I visit him. He tells me "When that moment comes, go to my grave site, and listen to the wind." Sure enough, on my next visit, Haj Ali was gone. He was my mentor and I learned so much from him about their Muslim culture and about life. I went to his grave and just listened to the wind. It was then that the wind told me that my field of dreams was not somewhere in a corn field of Iowa, or on the top of K-2, but right here in Balti, building schools for their children. The girls in these villages would walk three hours to school for five hours of education, then another three hours home. That's how dedicated they are in learning. I'm only glad that the schools I've built helped them in fulfilling their dreams. Greg: To fight poverty and illiteracy in Pakistan, the cost is $1/month per child. The United Nations have budgeted $8 billion/year for education to eradicate global illiteracy by 2015. We need to live not in fear but hope. We as adults have failed to bring peace to the world. If all the children get educated, perhaps they will bring more hope and peace. Our Central Asia Institute has built 55 schools and are now educating 22,000 children in Pakistan and Afghanistan. Q: What about the last earthquake in Pakistan? Did it destroy your schools? Q: What about organizations that are doing missionary work? Aren't they spreading religion instead of education? A: We're not interested in propagating political or religious ideology. Our main concern is literacy for the children. You know in all these years I've been in Pakistan and Afghanistan, not one Muslim proselytized to me. I've not seen one child whining in Pakistan. There are lots of whining children here in the U.S. Someone should do a research project on this cultural phenomenon. Q: What happened after 9/11? A: I was in Pakistan when 9/11 happened in 2001. I phoned my wife Tara in Montana. She told me that there were lots of hate mail and death threats from American people. My daughter got a phone call saying "I'm going to kill your Daddy because he's helping Muslim girls." But in Pakistan, a Muslim elder hugged me after 9/11 saying "You're here helping us to build schools for our children, getting funding to eradicate our poverty. I can't understand why those Muslims are destroying the World Trade Center and killing innocent Americans in New York. Pakistani women in the villages came up to me and handed a batch of eggs, saying "Bring these eggs to those widows whose husbands got killed in the World Trade Center on 9/11." Parade Magazine did a cover story about "He Fights Terror With Books" [April 6, 2003]. Our organization Central Asia Institute received $1 million in contributions after that article. The strength of this country is in its diversity instead of commonality. Q: What are your goals in the next five years? A: I like Joseph Campbell's remark "When you heart speaks, take good notes." We are now focused in getting girls from the remote villages to school. We put up eight schools in the Wakhan Corridor. We are recruiting local people in intensive training to teach the children. Q: Is there a local economy in these villages? A: There are poultry farms and forestry to make money. The infrastructure there is supporting war between India and Pakistan. The International Institute of Rural Reconstruction (IIRR) is a rural development organization that helps local people to develop enterprises. They established eel farming in Bangladesh. Q: Are there any embarrassment that the government is not doing their job? A: Their Education Minister boasted "We have schools in every district." But they've never even gone to those remote rural areas to check the illiteracy and poverty conditions there. Now, the Pakistan military is supporting our efforts. Q: What about nutrition in these villages? A: There is a huge protein deficiency in their diet. The people in the South Balti region have more vegetation where as in the North region less so due to the amount of sunshine they get. Q: Can you travel to Pakistan at any time? A: I got a page of my passport torn out by the Taliban. I got a 5-year visa from Pakistan and a 10-year U.S. passport. Q: Do you bring volunteers to the villages? A: Teachers come from within the villages. Most are women. We need to grow more master teachers locally. Q: How much does it cost to build a school there? A: $15,000-$20,000 to build a school. $35,000-$50,000 to build a school after to fund it with teachers afterwards. It is my hope that the royalties from our book Three Cups of Tea will generate enough income to set up an endowment to pay the local teachers in these schools. The Q & A session ended at 9 pm. Viking Press, New York (2006), 352 pp. "This is one protagonist who clearly deserves to be called a hero." A Roseville native writes of his work building schools.  "On pilgrimage, following spring"
that education will disempower the recruiting for terrorists." for the noble work he's doing.